Product categories of PP Handle Sharpener, we are specialized manufacturers from China, PP Handle Sharpener, PP Handle suppliers/factory, wholesale high-quality products of PP Grindstone Handle R & D and manufacturing, we have the perfect after-sales service and technical support. Look forward to your cooperation! A good honing steel is essential for keeping knives sharp and at the ready. 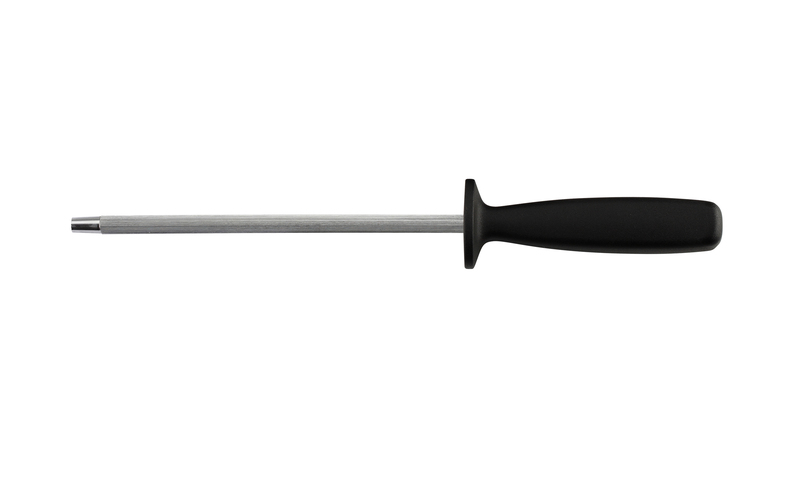 This durable version is crafted of high-carbon-steel and restores a knife's sharp edge by trueing it – that is, smoothing and realigning the blade's cutting edge to help it stay sharper longer.Maintains the razor-sharp edge of most knife blades between sharpenings; do not use on serrated or scalloped blades.Our PP handle sharpener sturdy high-carbon steel resists stains and corrosion.PP handle is contoured for a comfortable grip.Use with straight-edged knives only; not for use with serrated blades.Steel length should measure at least as long as the knife being honed.Hone knife before each use to maintain the sharpest edge.To properly hone the knife, hold it at a 20-degree angle and draw the blade across the steel. Never stroke the same side of blade more than once in succession.